Warning: this article contains images that some readers may find frightening. Have you ever come across a story on the internet that was so weird, so freaky, it couldn’t possibly be true? There’s a good chance it isn’t. In fact, it might just be another creepypasta floating around the web. OK, what is creepypasta exactly? Before you ask, no, creepypasta isn’t a questionable school cafeteria lunch. The term is used for amateur horror stories, some of which have gained such popularity that they have become urban legends on the web. 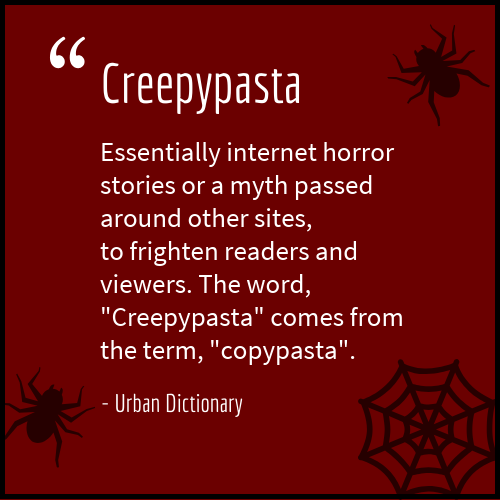 The term “creepypasta” is derived from the internet slang term “copypasta” (copy and pasted text). Creepypasta can be text-only, but some of the most famous stories were circulated with a cryptic image or video. Some of them are startlingly realistic. So realistic that the Slender Man (possibly the internet’s most infamous monster and now, the big screen’s latest horror villain with the upcoming Slender Man movie) tragically inspired two young girls in Wisconsin to attempt to murder their friend. 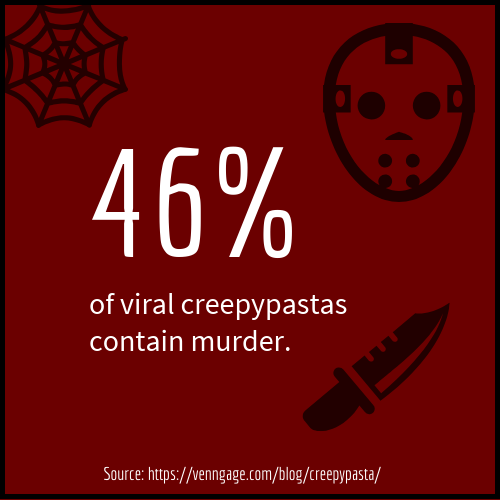 I wanted to take a deeper look at what makes for a viral creepypasta. What spooky elements, narrative choices, and subjects make for a story that people have to share with their friends? What horror story ingredients are most common in viral creepypastas? 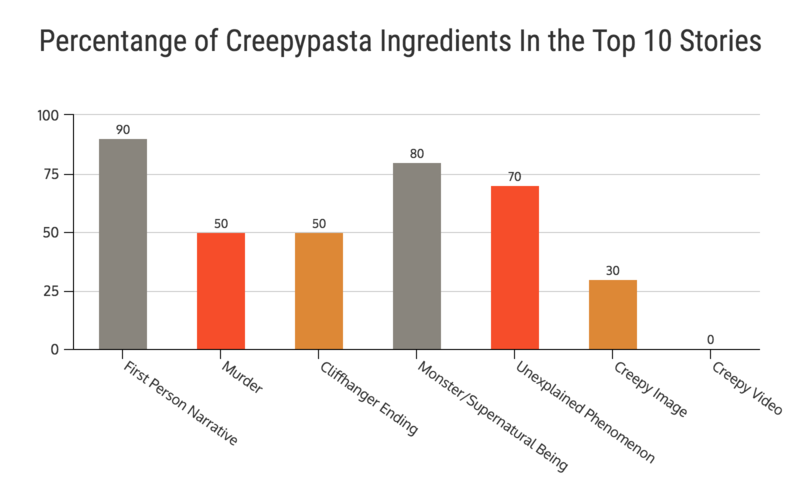 For this study, I read 72 the most shared and most discussed creepypastas on four popular creepypasta sites: creepypasta.com, creepypasta.org, the Creepypasta Wiki, and reddit.com/r/creepypasta. 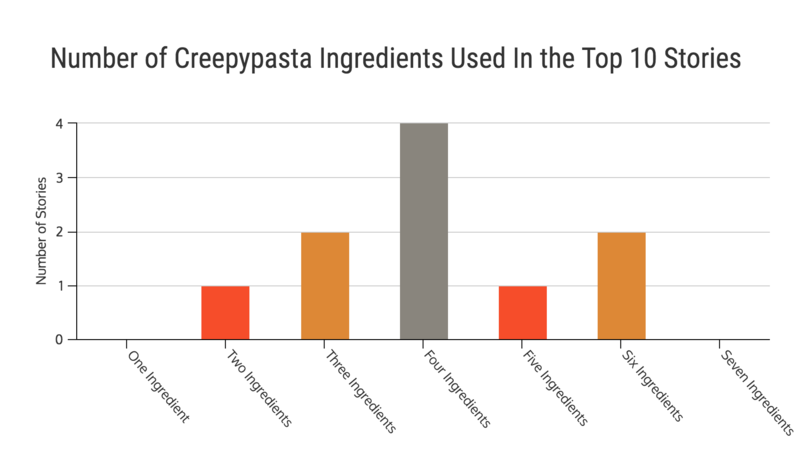 Let’s dig into each creepypasta ingredient. Stories told anecdotally were definitely a popular narrative device that many authors took. 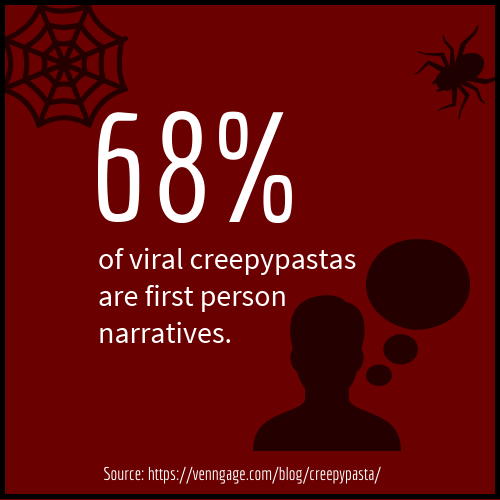 In fact, 68% of creepypastas are first person narratives. If a story is told as a personal account, there’s always the possibility that it could be true, even if you know that logically it couldn’t be. It allows for a certain degree of doubt, however small, that the story is fiction. In my opinion, this narrative device was particularly effective when used in stories that had to do with the internet messages or diary entries–Funnymouth and Ted the Caver being two great examples, respectively. Well, I think it’s safe to say that most people find murder terrifying. It’s no surprise that a large chunk of the stories I read–46% of them–contained either an act of murder or the direct aftermath of murder. A common criticism that I read in the comments section for stories containing murder was that authors would fall back on gratuitous gore to get their horror points. Some of the best creepypastas took a more creative route, relying on other elements of atmosphere, weirdness and surprise to spook readers. A great example is Abandoned By Disney, written by one of the web’s most esteemed creepypasta authors, Slimebeast. 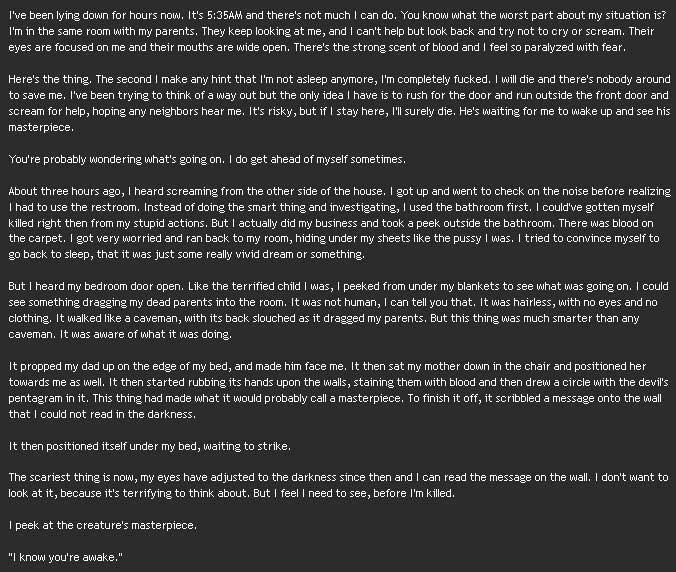 While 54% of the creepypastas I read didn’t contain a murder, many of them contained the implication of a murder to come–in the form of a cliffhanger ending (take this unnamed creepypasta, for example). 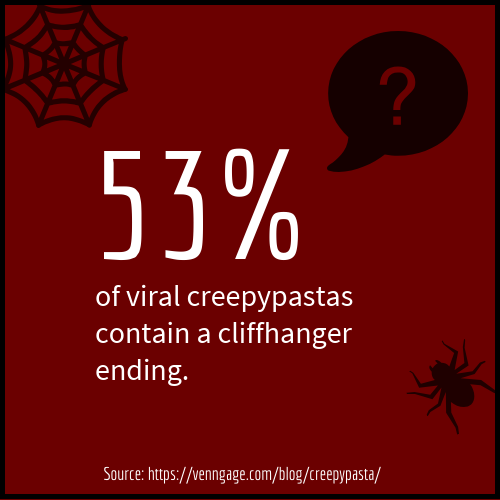 Of the creepypastas I read, 53% had a cliffhanger ending. Cliffhanger endings can be a cop-out. But when done well, they can keep the mystery alive and leave readers with a chill. This is especially effective in cases where the reader is made to question whether or not the same could happen to them–like in the zombie creepypasta Persuaded. 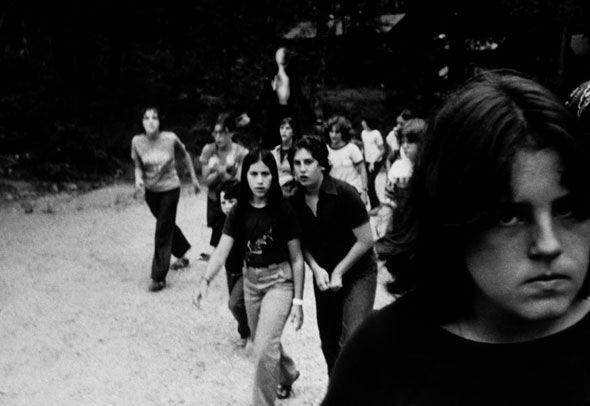 Given the popularity of the Slender Man, it shouldn’t come as a surprise that monsters, ghosts, and demons figure prominently in the most popular creepypastas. 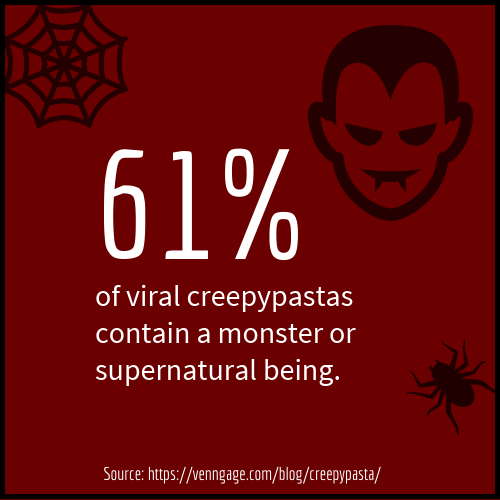 In fact, 61% of the creepypastas I read had a monster or supernatural being. 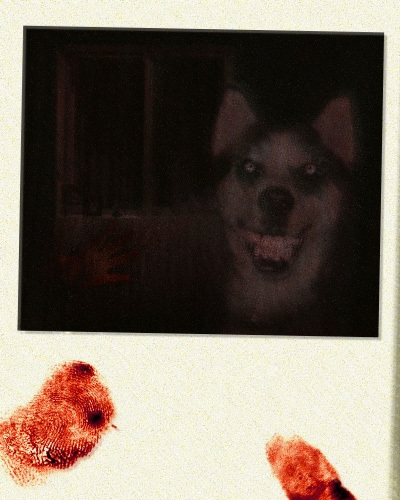 Such ghoulish creatures as the Rake, the ghost of Bedtime, and whatever the heck Smile Dog is. Sometimes the scariest monsters aren’t the ones that comes from somewhere unknown, but the ones that come from familiar places–like humans who have become monsters. The Russian Sleep Experiment is one such example. Some of the scariest things are the things we will never understand. Maybe that’s why 71% of the creepypastas I read had an unexplained phenomenon. Some strange occurrence or creature that came out of nowhere but has made an unalterable impression on our psyche. The Disappearance of Ashley, Kansas is a particularly unsettling example of this, made all the more effective by its transcriptions of faux telephone recordings. Did you know that our brains process images faster than words? According to a study by a team of neuroscientists at MIT, our brains can process entire images in as little as 13 milliseconds. So the moment you look at a scary image, it’s in your brain. It can be really hard to shake a disturbing image. 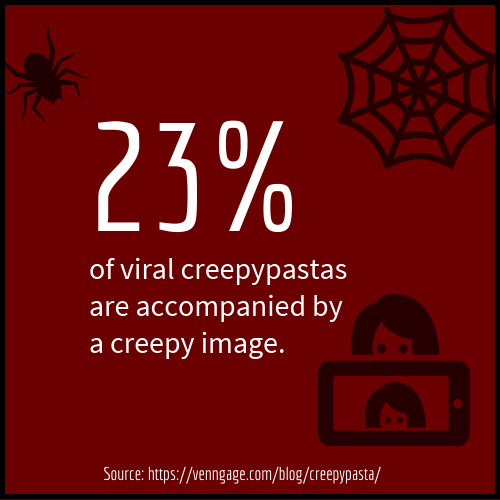 That’s why some of the most infamous creepypastas are synonymous with their images. 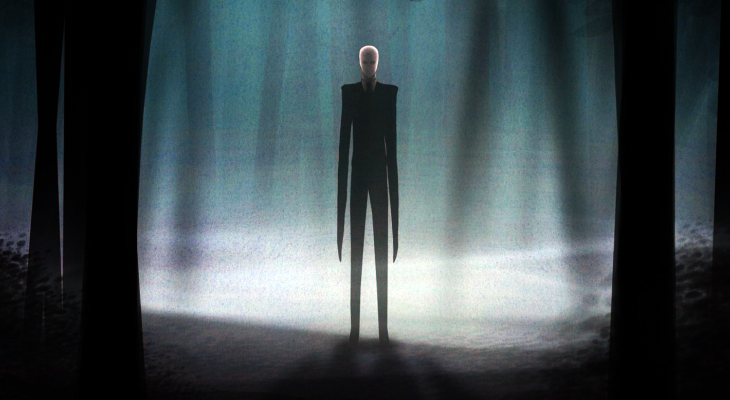 The Slender Man was an image before becoming a story character. Smile Dog and Abandoned By Disney seem to have always been accompanied by their iconic images. In fact, 23% of creepypastas I read were accompanied by an image (this excludes stories with fan images made after the story original story circulated). There were also two cases where the creepypastas were comics (both shared on the creepypasta reddit). These were really cool, because although you may think that a comic is not as creepy as a story, you would be mistaken. In these cases, the artists used some pretty interesting techniques to create atmosphere. The first is His Face All in Red, which uses black space on the page to build suspense. The second is this unnamed comic, which breaks the fourth wall at the end and turns on the reader. I noticed that a number of creepypastas had videos that accompanied them. After looking into it more, though, I realized that in most cases, videos were made by fans of the stories after the fact. 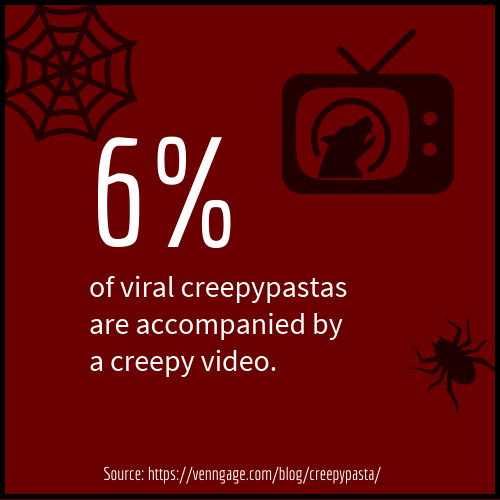 Only two viral creepypastas were first circulated with a video, a small 6%. One of those stories is the popular gamer creepypasta Ben Drowned uses a short video clip at the end to give readers an extra chill. Of the 72 stories I looked at, 10 stories in particular were shared across multiple sites, true to the copypasta form. These creepypastas also had some of the highest combined share counts across the four sites I looked at because of that. 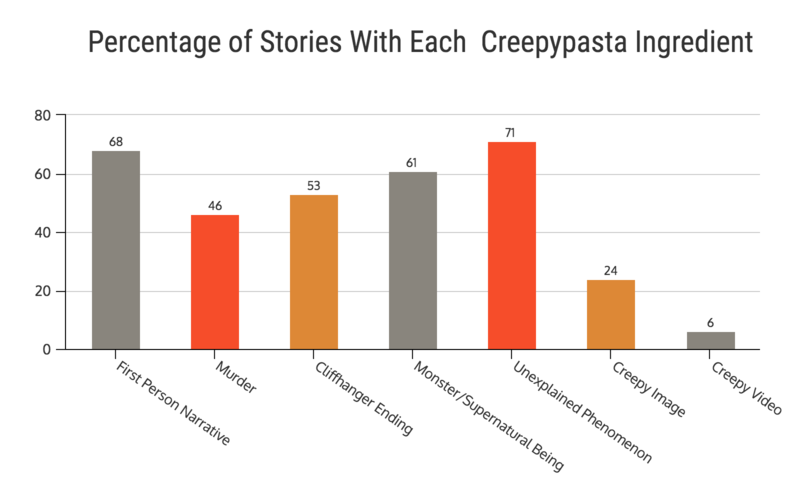 The two major differences from the overall sample were the percentage of stories with first person narratives and the stories that contained a monster or supernatural being. While 68% of the 72 creepypastas I read were first person narratives, 9 out of the top 10 creepypastas were first person narratives. And while 61% of all of the creepypastas I read had a monster or supernatural being, 8 of the top 10 creepypastas featured a monster or supernatural being. In other words, people really love personal accounts of encounters with frightening creatures. This goes to show that even though the medium of myth making has changed with the times, at the core, the stories that spook us are the same as they always have been. We’re all sitting around a virtual campfire, telling stories about what goes bump in the night. If you’re familiar with the popular canon of creepypasta, then you might be wondering why I haven’t included the Slender Man or Jeff the Killer in this list. I did this because I wanted to look at the metrics for specific stories that have been posted on multiple sites. 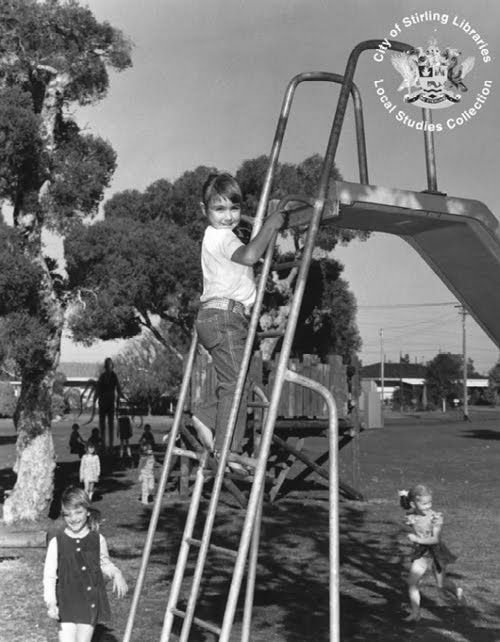 Because the Slender Man and Jeff the Killer both appeared first as images, the legend surrounding them has been built up over time by many different writers, video makers, and posters on forums. So what’s the secret recipe for a tantalizing creepypasta? The story with the most combined shares across all four sites is The Russian Sleep Experiment, with 64030 shares. The Russian Sleep Experiment has only four of the creepypasta ingredients. 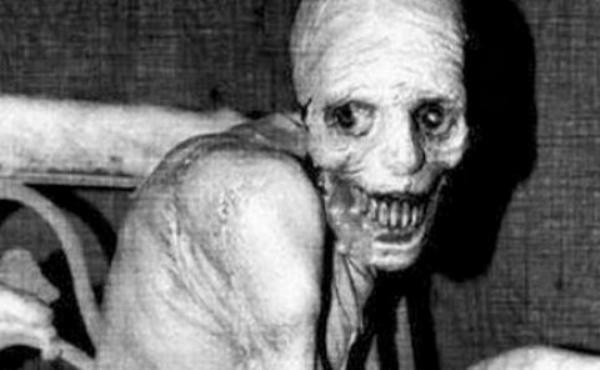 Interestingly, The Russian Sleep Experiment was actually the only story out of the top 10 creepypastas that wasn’t a first person narrative. The story with the second most combined shares is Squidward’s Suicide, with 37298 shares. 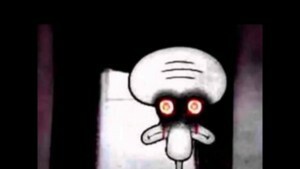 Squidward’s Suicide also has 4 of the creepypasta ingredients. Use no less than 2 creepypasta ingredients and no more than 6 creepypasta ingredients. The optimal number of ingredients is 4. Although the most shared story was not a first person narrative, the other 9 stories were, so it’s still a safe bet to make your story a first person narrative. What can we learn about writing from creepypastas? I read a lot of creepypastas for this study and most of them varied from ehh, to good, to great…but some of them seriously sucked. The best creepypasta contained fundamental elements of good storytelling, which can be applied to any genre. This can be used in virtually every writing context to make a piece not only more interesting, but more convincing. Even if you’re writing about a dry subject, you can use personal anecdotes to connect readers to the topic. If readers can connect with you, they will be more inclined to listen to your tips and suggestions. 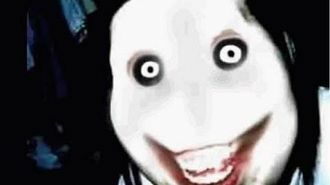 The notoriety of creepypastas like Jeff the Killer and Smile Dog are proof that images can make a big impression on readers. Images shouldn’t just break up the text–they should enhance and build the narrative. 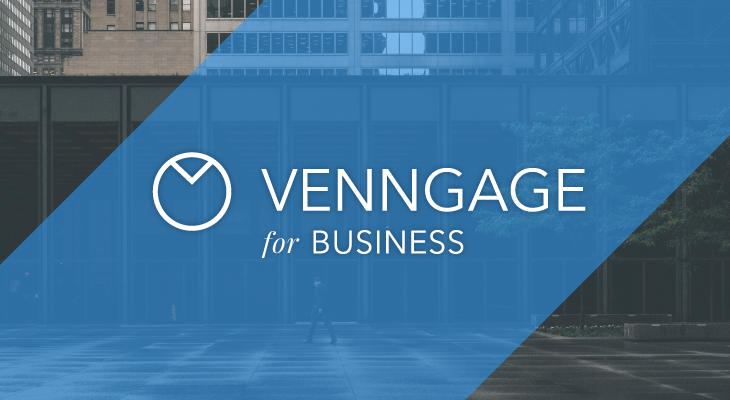 Take the tone and style of your text into consideration and use images that fit that same tone. The lesson here isn’t to always use a cliffhanger ending. That wouldn’t make any sense in a lot of cases (picture an article about “10 Tips to Improve Your Productivity” where the tenth step was missing…and never heard from again…). But you should leave readers wanting to read more by you–to check out your website or to learn more about the topic. You can do this by pointing them to where they can find more information, or by gating some your content (for example, offering an ebook to download). Some of the creepiest creepypastas were convincing because they made expert use of their medium. For example, Candle Cove (one of my personal favorites) is written in the form of a conversation in a forum thread about a children’s show that aired in the 70s. The author takes the time to create original typing patterns to each member of the conversation. They also rely on the vagueness and uncertainty of memory to build the mystery, making the whole conversation seem very realistic and unsettling. 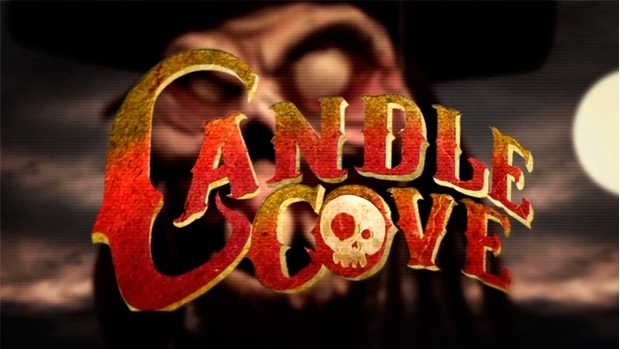 Because of this, many people have been led to believe that Candle Cove was a real show. You may be familiar with Marshall McLuhan’s famous quote, “The medium is the message.” Essentially, the medium that you choose to tell your narrative will have a profound effect on the narrative itself. 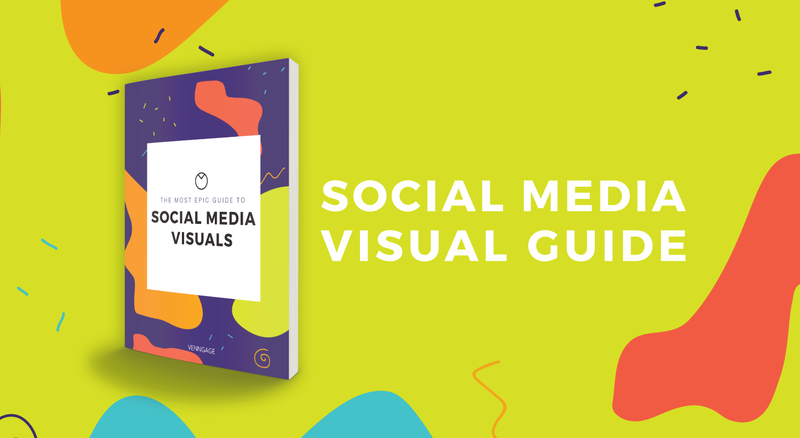 This could also mean choosing to make a video, record a podcast, or design an infographic. 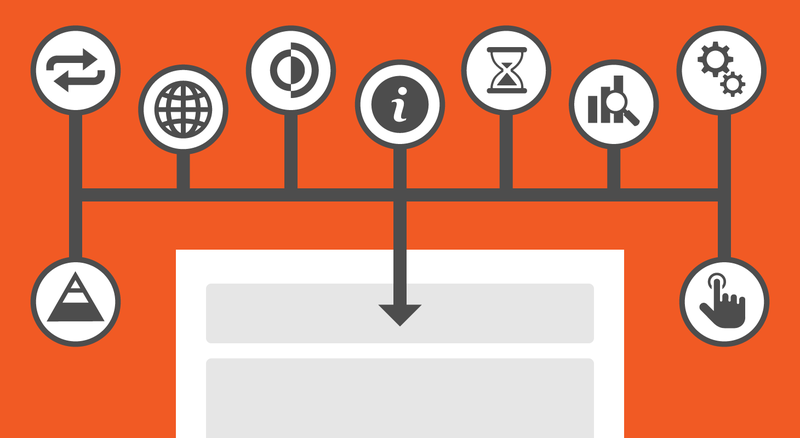 Consider which medium will communicate your story in the most engaging and convincing way. Most of all, what we can learn from creepypasta is to not shy away from an idea just because it has been done before. Find a way to make it new again. What writers of creepypasta have done is taken a tradition of urban myths and monster stories and updated them so that they are relevant in the age of the internet. This is a concept that you can apply to any story, project or product you may want to pursue–find something old that people connect with and update it, make it relevant, and make it new again. Want to make your own spooky infographic? 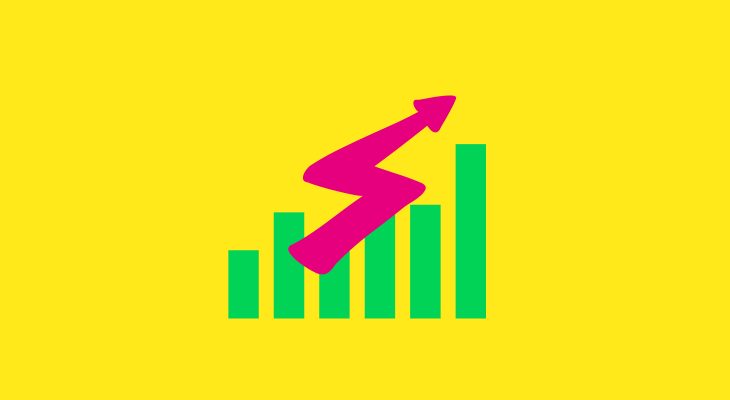 Visit our infographic templates page. 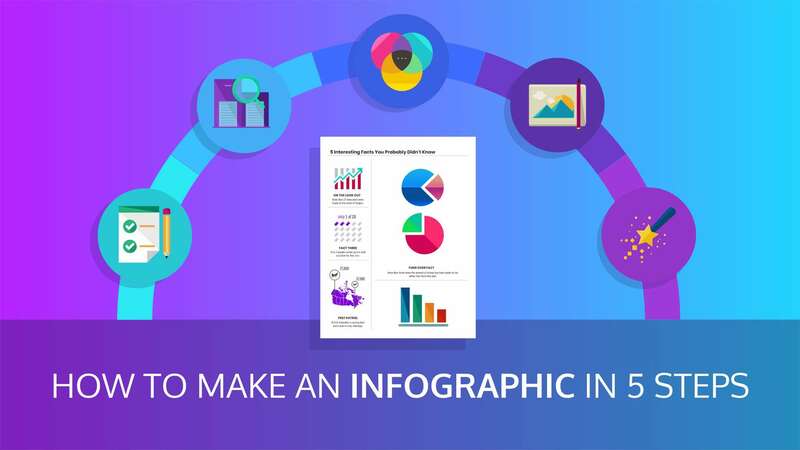 The infographic in this post was created by Joanna Lu.